In Recollections of My Life forMy Children, Rosamond Warren Gibson (1846–1934), onetime mistress of the Gibson House, recounts some of her fondest memories from her life. She shares stories told to her by older relatives, describes trips to Europe, and even relates vacationing in New Orleans during the Civil War (see “The Gibson Family in the Civil War,Part I,” May 21, 2015). Rosamond’s Recollections is a rich source of material for the stories we tell here at the Gibson House. 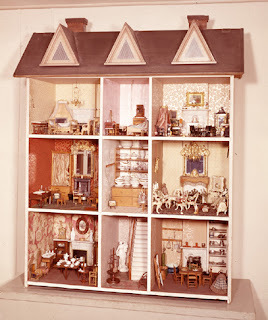 In writing about her childhood, Rosamond describes what must have been a magnificent dollhouse her mother had made for her and her sister Nellie. It was kept upstairs under a skylight at Rosamond’s childhood home on Park Street until she moved it to 137 Beacon Street when she married into the Gibson family. Here it was kept for her daughters Mary Ethel and “Little” Rosamond under the large skylight on the fifth floor. Years later, in 1926, Rosamond senior donated the dollhouse to what is now the Peabody Essex Museum in Salem, Massachusetts, where it resides today. More than five feet high with three stories and a working doorbell, the dollhouse certainly was an expensive toy and “was so wonderful that [Rosamond and sister Nellie] were seldom allowed to play with it, and it was always a sort of show piece,” she writes. Instead, the two girls played with their little cupboard dollhouse and used the larger one to hold parties and weddings for their dolls. The [library] was furnished with tall book-cases surmounted by busts, a fireplace with an English grate and mantelpiece, a little real piano, and furniture covered with red velvet. Over the mantel hung a mirror in a beautifully carved gilt frame. The drawing-room was papered with white and gold to match the furniture, which was entirely carved by hand, while on the floor was a carpet worked by my mother to look like an Aubuson[sic]. * Altogether it was an exquisite room. *Aubusson carpets were handwoven floor coverings originally made in the French village of Aubusson for the nobility. Today the term “Aubusson” is often used to describe rugs done in a tapestry style and commonly featuring a central medallion. Image: The Warren Dollhouse. Peabody Essex Museum, Salem, MA. Rosamond Warren Gibson, Recollections of My Life forMy Children, 1939, pp. 13–-15. 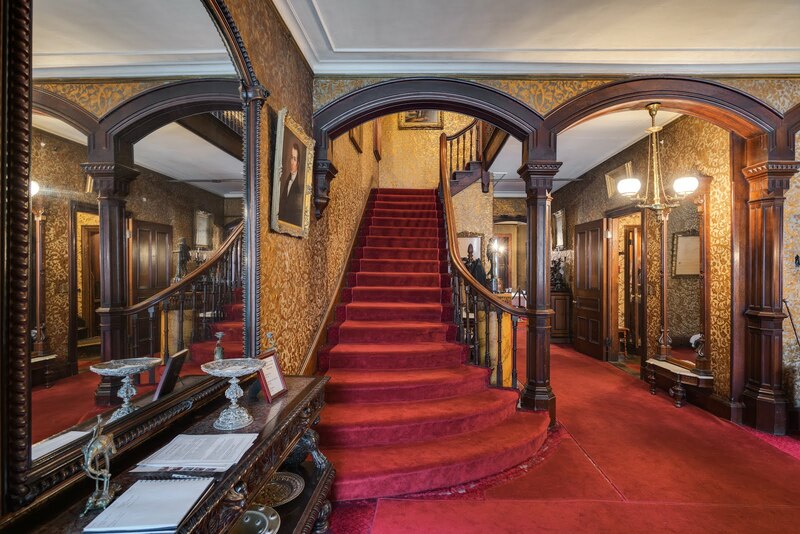 This blog was started by museum guide Katie Schinabeck, who wanted a place where she could share stories about the Gibson House and family that she didn’t have time to work into her tours. Katie has since left the Museum to pursue a doctoral degree in public history, and left the blog in the capable hands of the Museum’s current staff and guides. The Gibson House Museum. Simple theme. Powered by Blogger.